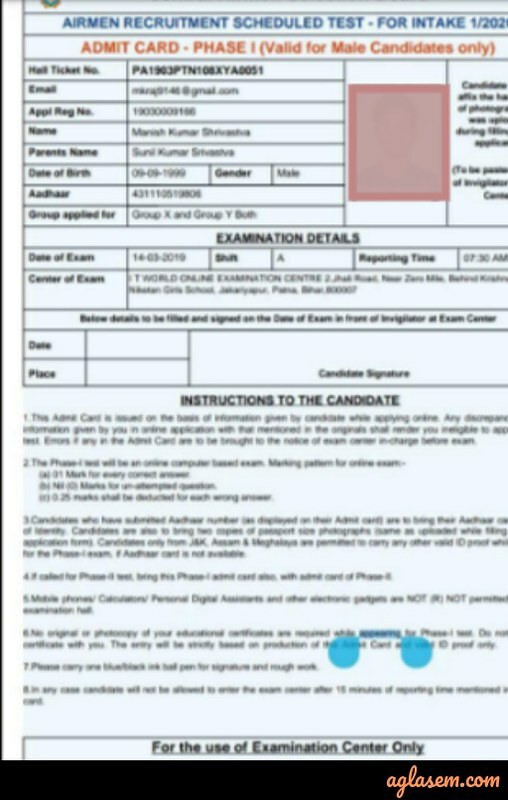 Indian Air Force Airmen Admit Card 01/2020 – Indian Air Force (IAF) has issued the Indian Air Force Airmen Admit Card for Phase II exam on April 09, 2019. The admit card has released at the official website i.e. airmenselection.cdac.in. 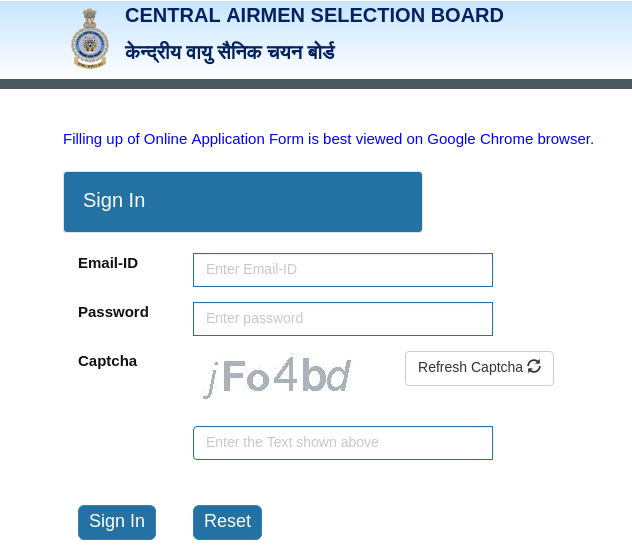 For downloading the Indian Air Force Airmen Admit Card 01/2020 candidates have to enter the email id and password. For each phase of the examination separate admit card will be issued. 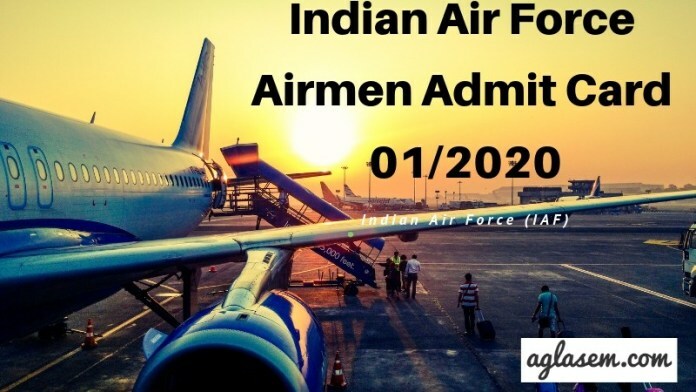 Get here full information regarding Indian Air Force Airmen Admit Card 01/2020. Indian Air Force Airmen Admit Card 01/2020 for Phase II examination has been issued. Scroll down to access the link. Indian Air Force Airmen Result 01/2020 and the list of candidates shortlisted for Phase II has been declared. Click here to check the same. The Indian Air Force Airmen 01/2020 Admit Card has sent at the candidates registered mail id. Admit Card will be not sent by post. For more information regarding Indian Air Force Airmen Admit Card 01/2020 check the scheduled given below. Admit Card: Click here to download the Indian Airforce Airmen 01/2020 Admit Card for phase II exam. Note: The above mentioned link will easily open from the mobile. The candidates who has qualified the Phase I examination those are called for the Phase II examination and for those only Indian Air Force Airmen Admit Card 2020 For Phase II (Physical Fitness Test) examination has been issued. Candidates can follow the steps given above for downloading the admit card. How To Download Indian Air Force Airmen Admit Card 01/2020? After downloading the call letter candidates should take the print out of it for future reference. Candidates can follow the steps given below for downloading the Indian Air Force Airmen Admit Card 2020. Thereafter, admit card login page will appear on the new screen. In the login page enter e-mail id and password. After entering the login details click on the Sign In button. Click at the download option for downloading Indian Air Force Airmen Admit Card 01/2020. After downloading the admit card candidates should check the details mentioned on it. From below candidates can check the details which will be mentioned on the Indian Air Force Airmen Admit Card 01/2020. Below mentioned documents will be verified before the commencement of phase II exam. While appearing for the exam candidates should produce some documents which have been listed below. Colour Print out of Application Form. Ten copies Recent passport size color photograph (same as used in the application form). From below candidates can check Details of Indian Air Force Airmen 01/2020 Phase II (Physical Fitness Test) Examination. Phase II examination is consist of PET, Adaptability Test I and II. The minimum physical requirement that will be expected from candidates is mentioned below. Note: Candidates are advised to bring their sports shoes and shorts/Track pants on the test day. The candidates who will qualify the Phase II i.e. Physical Fitness Test those will be called for the Adaptability test. For the Qualifiers of Physical Fitness Test Indian Air Force Airmen Admit Card 2020 For Adaptability Test will be issued at the official website. Steps for downloading the admit card has been described above. The candidates who will qualify the PFT they have to appear for the Adaptability test. From below candidates can check the Details of Indian Air Force Airmen 01/2020 Adaptability Test. Adaptability Test-1 is an objective written exam. In this test, the candidates will be tested as per suitability for the post and varied geographic terrain, weather, and operational conditions. Adaptability Test-2 is to select candidates who can adapt to the environment of the Indian Air Force and are able to adjust to the military way of life. Before starting the preparation candidates should first go through the examination pattern. Exam Pattern helps the candidates to know about exam duration, subject, language of the exam, questions types, and marks etc. From below candidates can check the detailed Exam Pattern of Indian Air Force Airmen 2020 Phase I Examination. Marking Scheme: For each correct answer, 1 marks will be awarded. Negative Marking: For each incorrect answer 0.25 marks will be deducted. Reasoning & General Awareness (RAGA). For Both Group ‘X&Y’ Trades. What To Carry On The Phase I Exam Day Of Indian Air Force Airmen 01/2020? On the day of the examination, candidates should carry the below mentioned documents. The applicants who will not carry the below described documents those will be not allowed for appearing in Indian Air Force Airmen 2020 Examination. Those who will qualify the phase I and II examination those will be called for the Phase III exam i.e. medical examination. IAf will issue them the admit card for medical examination. Candidates can follow the steps given above for downloading the Indian Air Force Airmen Admit Card 2020 For Phase III (Medical Examination). Medical Examination os the Final Round of the Test. The candidates will be tested for their medical condition by taking the following test.